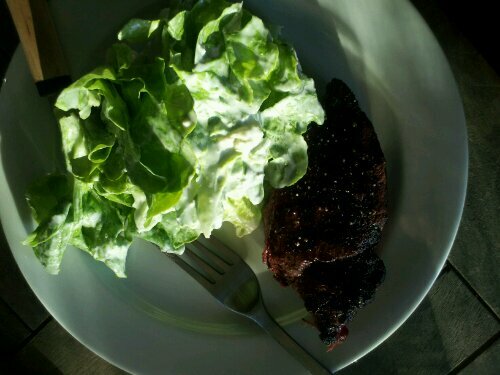 A simple dinner, just grilled steak and salad, but both parts were experiments. Jon tried a new method for the steaks, first cooking them with indirect heat until they reached 115°, then setting them over a very hot flame for a final sear, and I made an attempt at a blue cheese dressing that would go with both meat and greens. 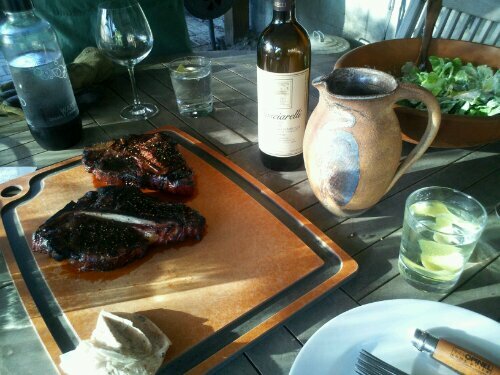 We had moderate success – the steak was a tad overdone, although far from inedible. It had a nice crust on it. The technique’s definitely worth revisiting, but with a little less actual flame during the final sear. My dressing came out pretty great, in spite of not having buttermilk on hand – I mashed a nice soft and stinky gorgonzola with a splash of milk, some mayonnaise, a clove of garlic and some white wine vinegar. The only problem was that I went totally overboard with the quantity, so after eating nearly a whole head’s worth of fresh green lettuce (and the steak) we were rather gorgonzola’d out. I’ll do this again, but make maybe half as much. Or save some for leftovers.